The panel all had strong views on this – there are some founders I know that have taken investment from the wrong people, it may have been the correct cheque but they didn’t have the right vision for working with the company. It’s not all about the money; the right people have to come along with it in order for your business to get the full advantage from the investment. Talking specifically about the marketing sector Sarah from Unruly acknowledged that there is a higher degree of collaboration than there was 10 years ago – when they were starting out. Now there is a greater sense of community throughout. If you can get a little self help group going in a kind of advisory board you can really help your startup to develop and recommend great things. Rose asked what the panel get from being mentors themselves and Gabbi, who spends a lot of time around start-ups mentoring them, was quick to jump in to say how exciting and motivating he finds being around young people with innovative ideas. ”I am able to learn and connect with lots of different people as well as seeing the next generation of things to come. When someone needs a solution and I know a startup with scope to solve that I can put them in contact and see how they can grow together and help each other out”. There was a bit of a gold rush with startups as people were thinking it would be a great opportunity to put some money into something and come out with a good PR story. Now times are changing and people are more focused on collaboration and the business model and how they could develop together. The real challenge isn’t starting out, or being a huge brand, the real challenge is scaling up and getting past that middle stage where you are neither. 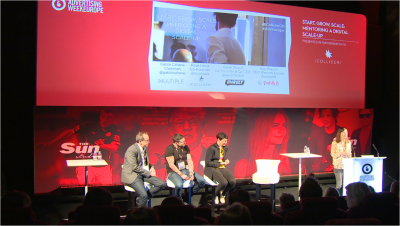 That’s when Rose invited three great start-ups to the stage to pose their burning question on growth and scaling up their business. The whole panel agreed passionately on this one: the most passionate person that really lives the brand needs to be ‘in-situ’ to set up a new team in a new country – and this is almost always one of the founders. The ‘right time’ to set up a new geographical office, therefore becomes a value equation based on likely gain from the new office versus the stability of the existing (in this case UK) office. If it makes financial sense for your company, and the team are ready for you to leave, then go. ”You are the best person to send out as you know the company better than anyone else, to really capture the audience’s attention you need an interesting and great story and you are the person who is going to do that the best as it is your product and your story.” The trick is making sure the gain is going outweigh the loss. Scale your team in the UK so they can manage without you and make sure everything is in place. The panel all had strong views on this since it is such a common scale-up issue., First up; bring people through who are already a part of your company and let them shadow you and see how you do things in order for them be more able and confident in taking it on themselves. You have to let go in order for your business to scale; if you carry on thinking that no one can sell as well as you can your business will grow at a much slower pace. Process is the trick to letting go – throughout all the business areas (especially sales) but this process-setting all starts with recruitment. Get really clear on who and what you want then organise your documents and create templates. Everyone will then go through this process and at the end they get a 15 minute founder interview if they get through to that stage. This is a good way of controlling the quality of the people that you are hiring. Sarah ended this with “I love watching people who can do a better job than I can: everyone does things in their own way, someone may shadow you for a while and then put their own spin on it, as long as this is effective and it works there isn’t an issue, loosen the reins but don’t stand for mediocrity”. The panel felt that the fact that Ofri felt as though there is that many mentors out there is a testament to lots of people doing lots of hard work, there is no “perfect mentor” and it is good to have a range of different people with different skills and to be seeking fresh mentors for your business. Sometimes there is already really great people already in your company and it is always worth having a look and seeking ideas from them as they already know the company well and may not have had the chance to share some of their great ideas with you. Pulling together a more focused advisory board is never a negative. This allows you to have a group of mentors who all have different ideas about what to do. By bringing them together on a monthly basis this gives them the opportunity to network and get to know more people in the sector, making it a benefit for everyone involved. The key to working with mentors is to be completely transparent – you do not want to make them feel as though they have wasted their time, you need to make them feel like they are adding value to your company and their time and effort has all been worth it.